Every HR manager has to make hiring decisions, and most of them use employment background checks to help ensure the decisions are the right ones. However, not every hiring manager knows the most important factors that affect how the background screening process works, or how it is limited. Here are 5 things to know that will make background screening research more efficient and more effective as a guide to making employment decisions. Subjects of consumer reports—including background checks—must be notified, in writing, that information about them will be used in making an employment decision and they must give written consent. CRAs have a general obligation to ensure that information is accurate, and must also correct any errors that may arise. In most cases, partly depending on local laws, CRAs may not report information that is more than 7 years old—including criminal background data. If you do the exact same kind of background check in the same jurisdiction repeatedly, you can probably predict when the report will be available, but variations do occur that can affect the reporting time. For example, the rules in state and local jurisdictions vary regarding how background information can be searched and reported, with potentially significant impact on timing. Verifications from previous employers or educational institutions may be, more or less, easy to obtain, with impacts on the time required. In general, hiring managers need to allow ample time for reporting and longer times if the background research is more complex. Managers also need to understand that “instant” background checks are very limited in the kinds of data they can acquire, and are likely incomplete. The “Ban the Box” laws that are popping up in state and local jurisdictions across the country are quite different from each other, but they have a common core in seeking to boost employment among ex-offenders. They do this by limiting how and when criminal background information can be used in the hiring process. Every hiring manager needs to understand these rules in his or her jurisdictions. Employers sometimes choose simple exclusionary rules for efficiency that coincide with their views on fairness, such as never hiring an ex-felon. However, hiring managers need to know that agencies like the Equal Employment Opportunity Commission, and even some of the Ban the Box laws, may view such policies as discriminatory. Known as “disparate impact” discrimination, the problem is that blanket policies may disproportionately exclude protected classes (based on racial groups, gender, or one of several other categories) from employment because the reason for exclusion is more common in a certain group. Significant fines can be levied for failure to comply. The FCRA has rules that hiring managers must follow if they want to exclude an applicant based on a background check. Before you take an adverse action: You must give the applicant a copy of the background screening report you are using, plus a copy of their rights under the FCRA law (linked above). After you take an adverse action: You must give the applicant notice that you have excluded them based on the report. You must also tell them which reporting agency did the research and that they have rights to dispute the report. Read more about the adverse action two-step here. 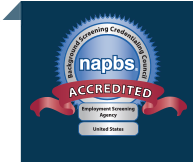 The employment screening process can be complex at times. Awareness of these five factors can help you more effectively manage the background screening process for your company—both for your job candidates, and for stakeholders in the organization as a whole.